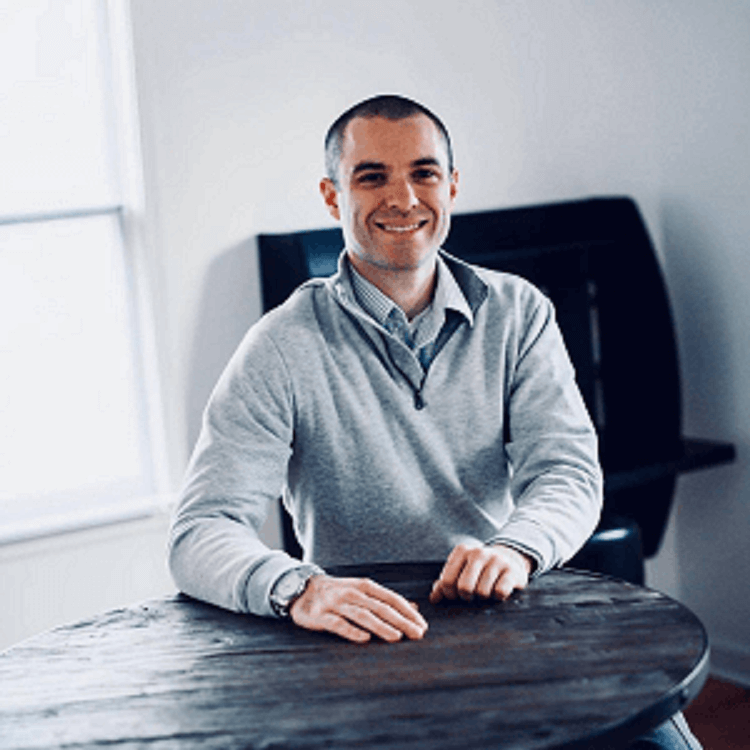 Today’s interview is with Jeff, one of the bloggers at DollarSprout. This interview was conducted at the end of February 2019. My name is Jeff Proctor. I’m a 29 year old unmarried guy living in Blacksburg, VA.
I’ve been dating a girl for about 3 years now, so the “unmarried” part will most likely change in the next year or so (fingers crossed!). I graduated from Virginia Tech in 2013 with a degree in biochemistry, however, I am now a full time personal finance blogger over at DollarSprout. I started in 2015 with my college buddy, Ben Huber, who used to work full time as a Registered Nurse. I have two answers to this question, each of which are very, very different. Obviously there is a big discrepancy between Version 1 and Version 2. It feels incomplete to portray either one individually as the complete picture, which is why I mapped out both viewpoints. In one version I’m an average young professional and in the other version I’m technically worth a few million dollars. I will periodically run our business “numbers” through a valuation tool like Empire Flippers has just to get a rough idea of where we things stand from a total valuation perspective. Even though the temptation is sometimes there, Ben and I have no intention of selling our business anytime soon. 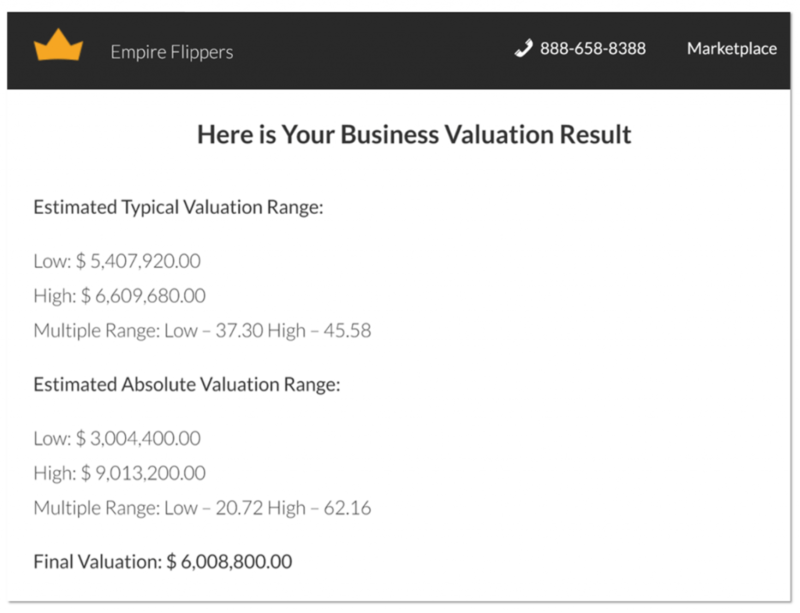 It’s by no means a comprehensive, deep dive valuation, but it does give us a general range to go on, which is helpful. And of course, a lot of factors can quickly change this valuation (up or down). That’s why I don’t necessarily look at this as money in the bank — because it’s not! At this point, nearly all of my assets (liquid and non-liquid) have come from business earnings. I did inherit $2,000 from my grandma that went toward the down payment on my car a few years ago. Other than that, I have not inherited money from anywhere. My parents helped me pay for about half of college, but I still accumulated about $25k in student loan debt. 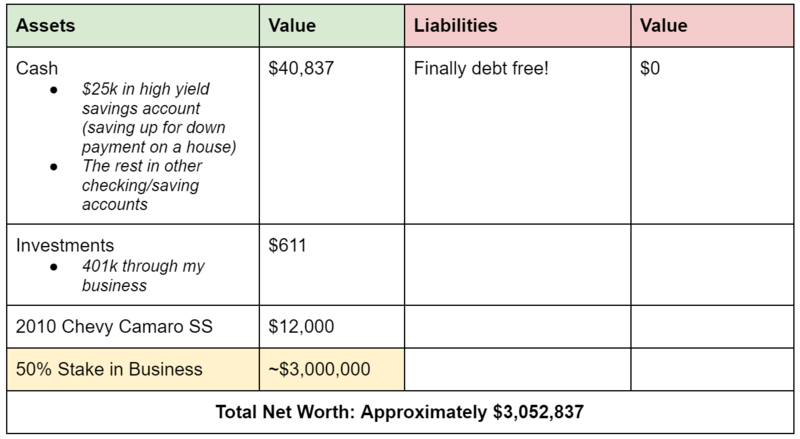 In total, I have paid off roughly $45,000 in debt. I think in a society like today’s that is so focused on acknowledging privilege and circumstances when evaluating someone’s success, it’s important to recognize that most people exist somewhere in the middle between the “haves” and the “have nots”, myself included. I’ve had it worse than many, but I also had it a lot better than others. Growing up with just my mom, I definitely didn’t start my life with a leg up on many from a socioeconomic perspective. We took public transportation everywhere, I used to go to work with her when she couldn’t afford daycare, we lived with my uncle for several years, etc. But over the span of my childhood, our circumstances slowly and steadily improved to a point where many would classify my circumstances as “privileged” by the time I was entering college. As I mentioned before, right now I run DollarSprout as my full time job/career. DollarSprout is a personal finance blog that helps people find new ways to make and save money. We reach over a million people each month, which is something I am really proud of. The business makes money primarily through affiliate marketing, which is when we earn a commission on a product or service mentioned in an article. For example, we recently published a review of a bank, which is the same bank that I am using to hold the money I am saving up for my house down payment. If someone reads that review and goes on to sign up for a new account, we get a small commission from the bank. In an ideal world, this entire transaction is a win-win-win for everyone: the reader gets paired with a bank that pays a great interest rate, the bank gets a new customer, and DollarSprout can keep the lights on for another day. 2011 Income: $10,663. 21 years old, and a junior in college. I worked two jobs while in college; I was an overnight campus security guard and a front desk employee at a math tutoring center. My overall mental health was not in a good place; I was struggling with school, was always worried about money, had no realistic career plans yet, etc. 2012 Income: $5,818. This was the year I was supposed to graduate, but I failed too many classes. I quit my security job to save my sanity and try to finish out my degree. I ate a lot of Ramen and rice and beans in 2012. It was not my best year. 2013 Income: $12,844. At 23 years old, I graduated with a 2.7 GPA in an area of study I had zero interest in pursuing a career in (biochemistry/medicine). I wanted to work in finance, but no one in finance wanted me. After 50+ rejected job applications, I finally got an internship at a local wealth management office for $8/hr with no benefits. This was my best option at the time, so I took it. 2014 Income: $29,498. My timeline is somewhat hazy here, but I had a handful of raises in 2014. I went from $8/hr to $12/hr, then $16/hr with limited benefits. This was the year when I started to become very jaded with the idea of working for someone else. Looking back, I’m glad this happened to me so early in my career — the idea of entrepreneurship was just now starting to creep into my mind. 2015 Income: $24,850. 2015 was an important year for me. After asking for a substantial raise in early spring, I was moved up to a $40k/yr salaried position. The problem was, I asked for $65k/yr, which was based on my current workload, new licenses/certifications, etc. I decided to leave my job on August 1st, 2015 to dive into entrepreneurship. I had about $23,000 saved up, which was supposed to be enough to last me a year. 2016 Income: $11,678. Turns out, starting a business from scratch with no experience is harder than people make it sound. After 10 months of trying to make things work, I was dead broke. I had literally zero money to my name and about $2,000 in credit card debt. I picked up a job at a local hospital, where I got paid $11.36/hr. I was working in the inpatient psychiatric unit. My job responsibilities included handing out meal trays, giving baths to patients, and sitting with people who were at immediate risk of harming themselves. Of the $11,678 I made in 2016, only $913 came from the business. The rest was from the hospital. I wasn’t ready to give up on being an entrepreneur yet, though. 2017 Income: $46,667. This is the first year that things started to take off for our business. I built up the courage to leave my job (again) and try being on my own. $36,337 of my income came from the business and $10,290 came from the hospital. 2018 Income: $92,036. All of this income came from my business, and the trend started to sharply increase in the last 4 months of the year. We finally started getting solid systems in place that are hopefully going to allow us to scale further. 2019 Estimate: $300,000+. I am realistically expecting DollarSprout to earn somewhere north of $2M in revenue in 2019, and that’s assuming virtually no growth over the next 12 months. Ben and I are trying to reinvest profits back into the company as aggressively (and responsibly) as we can, but I still think we will be splitting a nice sum of money when it’s all said and done for the year. Of course, nothing is ever guaranteed! I have no side hustles right now; I am 100% all-in on DollarSprout. While I am still unmarried, I am content with spending all of my time working on the business. I’m sure at some point I will want to scale back to focus more on family (if/when that happens), but for now I am satisfied with how I am spending my time. I used to be a 1 or a 2, but now I would give myself a 7. I’ve always compared my success to the success of other people who have achieved way more than me, which, admittedly, might not be the healthiest mindset in the world. That being said, I don’t think I’ve fully lived up to my potential yet. I’ve got plenty of room to grow, provide more value to people, and earn more. I’d like to see how far Ben and I can take DollarSprout before our own personal lives and families take priority. Whether that means growing steadily from here or exploding the brand into a household name over the next 5-10 years is yet to be determined. Since my personal finances have changed so drastically over the past couple years (and even the past few months), this answer also changes. $20,000 (composed of $5,000 salary and $15,000 profit distribution). Ben and I are staying conservative on the profit distributions for now; we could likely take considerably more for ourselves. Set aside $8,000 for taxes right away. $200 automatically goes into 401(k). I contribute 4% of my salary component and have a 4% “match” from the business. Paid off the last $4,000 on my car loan. Put $5,000 towards my house down payment fund. That left me with about $3,000. 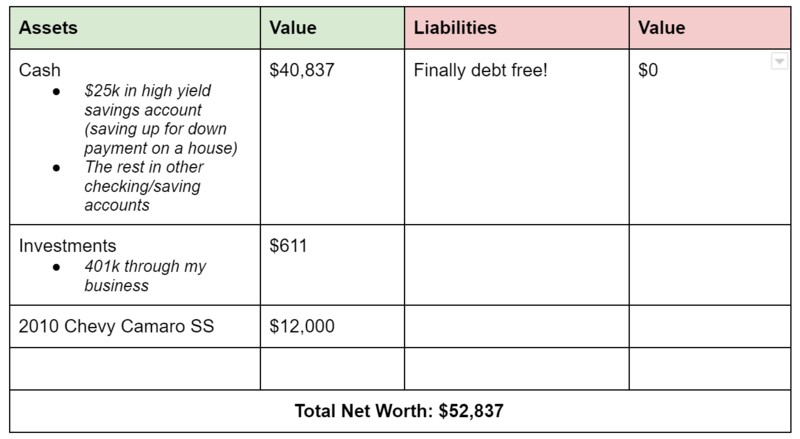 As I’m heading into my first official debt free month in March, I still plan to live off about $2,000 a month or so. I don’t have any real desire to drastically inflate my lifestyle; the biggest change that has happened in terms of lifestyle inflation since my earnings have improved is that I eat better, healthier food now. I also eat out more often (usually healthy places, though), as this is a way for me to buy back my time. Long story short, you can say that I live off of about $2,000 a month on a $20,000 monthly income. If my personal income increases to $30-40k+ per month, I don’t anticipate a dollar-for-dollar lifestyle increase. Starting my own business and not giving up when all the signs pointed to “hey, this probably isn’t for you,” has been the key to getting where I am today. I’ve had every reason to give up, but I didn’t. Also, being roommates with my business partner and still living in our college town has definitely helped Ben and I both avoid the urge to keep up with the Joneses. I’m pretty sure everyone in our small apartment complex just assumes we are grad students. It’s easy to just lay low and save some money. Since most of the money I am saving right now will eventually be spent on various goals I have, I have a hard time giving myself anything higher than a 7 here. I’ve found that it is much easier to save money when you make a lot. Who woulda’ thought?! For now, my focus will be on continuing to grow my income. The “saving money” mindset is all I have known for my whole life, so I’m confident I’m doing about as good as I can in that department. I’d rather widen the margins by increasing income than by further reducing spending. I have a simple yet aggressive portfolio that I started on January 1st, 2019. Our business now offers 401(k) and other benefits to employees, so I figured I should get back on the investing bandwagon. 2% in just a few months is pretty good! In all seriousness, though, having $611 in a 401(k) at 29 years old would probably score me a solid 1.0. Right now I’ve got my allocation set up at max aggressiveness, at least until I have a meaningful amount in the account. I will definitely scale back the stock allocation as I get older and have more assets. With each of these three options, I have a more active role in determining my investment results, which really appeals to me. For instance, with each $1 in monthly profit that I can create for DollarSprout, I can expect to capture an additional 15x-60x return if I sell the business (depending on what multiple the business is sold for). Even though it’s up to me figure out how to generate that profit — not an easy nut to crack, mind you — the returns are significant. Of course, I don’t want all of my eggs in the DollarSprout basket. I want the opportunity to start and run other businesses at some point. I love the challenges of entrepreneurship and playing the “game”. I also think real estate might be one of the best options for combining the passive nature of investing and the hands on element of entrepreneurship. My greatest strength is definitely the Earn aspect, and it’s also the part of my game that’s improving the fastest. I think my Saving skills are good enough to at least not hurt me, and my Investing skills are also decent; they just look different from how other people traditionally think of investing. Hmm, the biggest one that comes to mind is leaving a comfortable job to dive into entrepreneurship before my business was even making one penny. I definitely would not recommend doing that. That being said, I don’t necessarily see my story playing out any other way. I was 100% miserable working for someone else and needed a way out as soon as possible. Hi Jeff, I think you have a very unique story and not the traditional career path we often see. Good on you for taking care of your debt and maintaining a pretty strict spending discipline. I checked out your blog site and I think it is quite impressive as are the numbers you and your partner have generated in fairly short order. 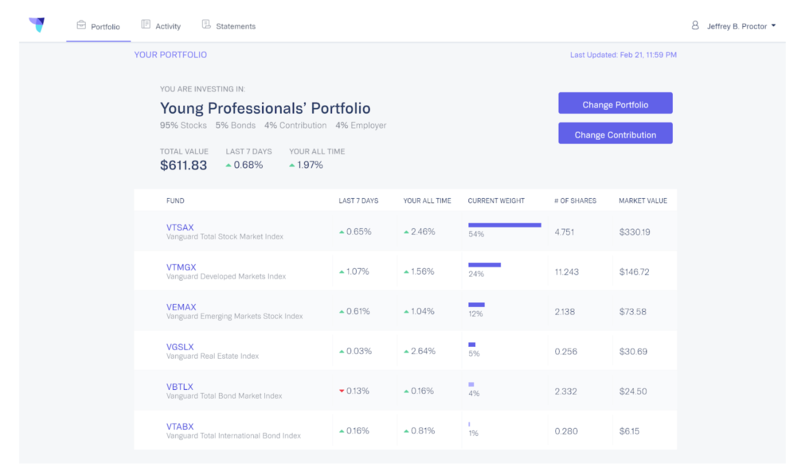 To answer your question at the end of your interview about investing in the stock market, my personal feeling is that you would be well served to begin investing in a diversified portfolio of index funds. I think the market still has a long-term positive trajectory and a strong case that we are in a secular bull market. It will still be volatile but for someone who is only 29, you have a long horizon to weather the ups and downs and over the next 20-30 years, I think you will be able to count on average high, single-digit returns over that period. I was about your age when I got serious about investing and the stock market has been my ticket to FI. You are an entrepreneur so as your money starts to roll in, you will be tempted to put savings into future ventures or your existing venture. A good balance to that is a well-diversified portfolio that you can just “set and forget” and let compounding do its magic. This way, you don’t have all your eggs in one basket and you have a bit of a safety net to fall back on if some of your future ventures don’t exactly pan out the way you planned. An equity portfolio will also provide some security and peace of mind as you take the plunge into marriage and beginning a family. Your current occupation is high risk-high reward and I think that needs some balance to it that an indexed portfolio might provide. Best of luck with your future endeavors. I think you are off to a great start! I do plan on maxing out my 401(k) this year, which will be a first for me. I definitely have some catching up to do on the investing side of things, but I am hoping I can get ahead of the game fairly quickly. I think things will settle down quite a bit if/when I get a house — right now I am just in savings mode for that. Anyway, glad you enjoyed reading about my situation! Great interview! You have a unique trajectory compared to other interviewees and great job with avoiding lifestyle inflation. One question: what do you think contributes to the explosive growth of DollarSprout from 2018 to 2019? Thank you! I had a lot of fun putting these answers together. Each item can become quite complex, but I think looking at the big picture is something more business owners should do. hahahaha – good luck selling your website for $3Mil! We probably wouldn’t sell it for under $6M but thanks for your encouragement!